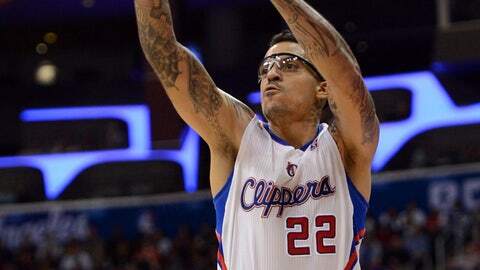 LOS ANGELES — Matt Barnes pointed to a small abrasion on the corner of his right eye Saturday night, the result of getting elbowed on the protective goggles he was wearing for the first time in his career. "I can’t stop getting injured," he said. 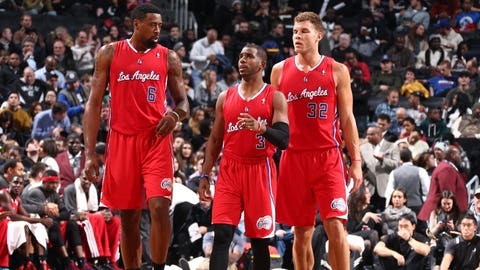 It’s been happening to the Clippers forward since the start of training camp, but this is something he can live with. After missing 16 games following three separate surgeries on his left eye, Barnes finally got back on the court. He had 13 points in almost 22 minutes, playing a contributing role off the bench in the Clippers’ 112-91 win over the Denver Nuggets. Not bad for a guy who missed virtually all of camp and the preseason with injuries and sat out 16 games because of a torn retina. "He looked good," coach Doc Rivers said. "He broke some of my rules defensively and things like that, but overall he was really good. He just gives us something extra. You can see it. He gives us the toughness, the cutting, the basketball IQ." Barnes will fit neatly into a rotation that has the Clippers on a roll. The win was their fourth in a row and sixth in seven games. In their current winning streak, they’ve won by 16, 23, 13 and 21 points. Again, it was defense that stood out. The Clippers held the Nuggets to 35.2 percent shooting and limited them to two periods of fewer than 20 points. The Nuggets made just 6 of 30 three-point shots against a Clippers team that last season ranked among the worst in the NBA at defending the three. Then there was Barnes, who put on a pair of protective glasses when he entered the game late in the first quarter and gave the Clippers a quick lift with his energy. But make no mistake — the look doesn’t suit him. "Whatever it takes for me to play," he said. "I don’t see myself wearing them too long, so hopefully the doctor agrees with me and I can get those things off." Barnes said maybe he’ll ditch them in a week or so. But they hardly seemed to impact his production. "I love having him back," Blake Griffin said. "He’s a guy that has a positive impact even if he doesn’t score a basket, just the way he cuts, offensively, the way he plays defensively and his experience. Having a veteran guy like that on the floor that always plays hard is great for us." Jamal Crawford for 27 points and made 6 of 12 three-points, and Griffin and guard Chris Paul each had a double-double: Griffin finished with 24 points and 16 rebounds, and Paul had 10 points and 11 assists. Griffin had the move of the night, doing a 360 and dribbling behind his back on a second-quarter drive that drew a foul from Nugget guard Ty Lawson. Asked where that move came from, Griffin answered, "I don’t know. I blacked out."